Whether you want baby shower favors to create a magical winter wonderland at your shower or you’re just looking for gifts with a touch of winter style to complement your decor, here are some fun baby shower favor ideas with great winter style. It can be hard to find baby shower favor ideas with winter style, especially if you want gifts that have a specific baby theme. This is when it’s a good idea to think outside of the box and figure out other ways to incorporate a baby theme while upholding the winter season through other decorative elements. 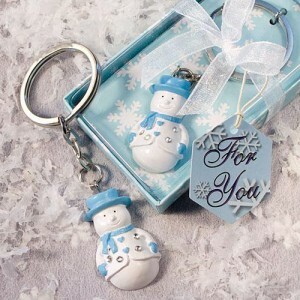 Snowman Key Chains or Candle Favors—Snowmen themes are always perfect for winter party occasions, and the snowmen key chain and candle favors are great options for any baby shower. They have the winter theme going on, but they are also bright and colorful, with a cheerful spirit for a baby shower. Snowflake Place Card Holders—Along with snowmen themes, snowflake accents make pretty decorative accents for a winter-themed baby shower. Try these place card holders to add to your place settings and see how easily they can transform the look of your winter shower. These snowflake place card holders are especially good options if you’re planning the shower for a friend or family member and aren’t sure what kind of style or theme the mommy would prefer. They are simple and versatile enough to blend with any setting without overwhelming the party’s ambience. 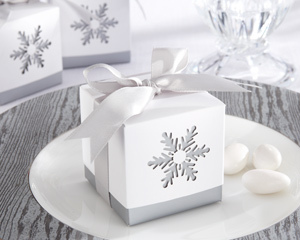 “Winter Dreams” Laser-Cut Snowflake Favor Box—Another versatile baby shower favor idea, this favor box design works with just about any shower theme you have in mind. You can fill these boxes with treats of any kind and use them to dress up your place settings. We love the laser-cut design that dances across the front, don’t you? This is one of the most stylish baby favor ideas you can find. This entry was posted in Winter Baby Favors and tagged baby favor, baby favors, snowflake baby favors, snowman baby favors, winter baby favor, winter baby favors, winter favor, winter favors. Bookmark the permalink.